An Early Medieval gilded silver disc brooch with surviving silver wire loop and Terslev-style design, dating from about 900-975 AD. Description: The brooch is circular and 26.8mm in diameter, with a very slightly domed front and a central raised dome of 6mm diameter. The silver is gilded on both faces, but with more surviving on the front. The central dome is decorated with a small moulded ring in the centre, surrounded by a ring of slightly oblique radiating ribbing. A 2mm band around the base of the dome is also decorated with similar radiating ribbing. The edge of the front has a single-groove border, and the area between the border and the central part is filled with a chip-carved design of three relief Terslev-style volutes (Kershaw pers. comm. 6/5/2014) which are interlaced with additional double-line strands. The three 'volutes' (here raised T-shaped elements) have much of their gilding worn away. The crossbars of the Ts form a frame around the central dome and outer ring of ribbing, and are each decorated with a longitudinal groove. The stems of the Ts are short and wide, and are each decorated with a pair of longitudinal grooves which end short of the crossbar and terminate in round dots. The double-strand interlace is in lower relief and so retains more gilding. Each of the three panels of interlace is identical and consists of two simple loops and twists; the specific details are unclear, but one set of strands appears to spring from the end of one T crossbar, pass under the base of the stem of the next T, and rejoin the third T at the crossbar. Each T also has one half of the crossbar shortened where another double strand crosses it. The reverse is generally flat, but slightly dished in the centre; there are possible traces of thin gilding around the outer part of the reverse. On the reverse is a double pin lug at right angles to the edge of the brooch, but the iron pin and the axis bar are missing, just leaving a ferrous corrosion stain. There is a scar, again perpendicular to the edge of the brooch and parallel to the pin, where the catchplate is now missing. There is also a third lug, again perpendicular to the edge of the brooch, positioned near the edge and equidistant from the pin lugs and catch. This holds a loop of silver wire (ungilded), decorated with circumferential incised lines forming beading, and closed by crossing the ends of the wire and twisting them twice around the hoop. Dimensions: The brooch is 26.8mm in diameter. The brooch plate is 5.48mm thick at the dome and 1.6mm thick at the rim. The pin lugs are 4.9mm tall. The wire loop is 10.7mm long, 9.04mm wide, and 1.94mm thick at the knot, with wire 1.1mm in diameter. 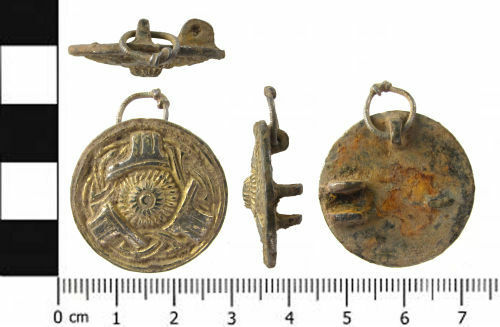 The third lug, probably a suspension or attachment loop, is often seen as characteristic of Scandinavian brooches (Kershaw 2013, 24-5, Table 2.1, 161-70). Compare, for example, YORYM-25E682 and NMS-870EB5, and trefoil brooches such as SWYOR-913447. Date: The use of the Terslev style dates this object to the tenth century, c. 900-975 AD. As the brooch is made of precious metal and is more than 300 years old, it meets the requirements of the 1996 Treasure Act.